“Meet,” “meet with” or “meet up with”? If you’re like most English learners, you’re probably getting these phrases mixed up. We use these phrases in slightly different ways, and we can sound very unnatural if we get it wrong. Let’s look at them and solve this problem once and for all! This is Kelly, and she’s meeting Tolga. This is when we start talking to someone for the first time, and we go from not knowing who that person is to knowing who that person is. No prepositions, no alternative words. Now let’s get to the more interesting stuff. 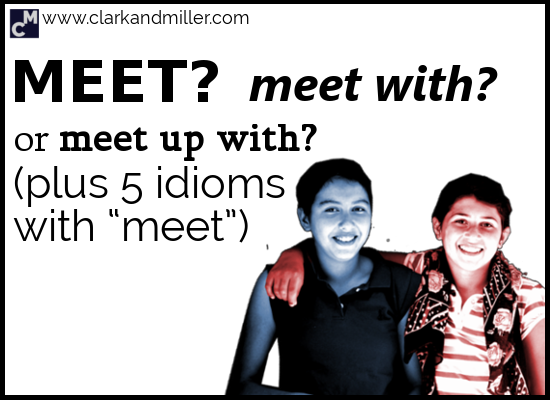 So I tell them that they shouldn’t use “meet with” and to use “meet” or “meet up with” instead (more on this later). Hang on! Why is “I met with this man” wrong and “President Gump is meeting with the king” right? The difference here is about how formal the situation is. Meeting a friend in a cafe is not a formal situation. But when presidents meet kings, and the news is reporting on it, the situation is suddenly a lot more formal, right? By the way, we can also just use “meet” for this situation. It’s a little less formal but completely acceptable. So, we can use “meet with” for very formal situations and “meet” for any situation. So naturally, you want to hang out with some friends. It’s more informal and friendly. Simple but important stuff, right? Example: Bond! Bond is the example! Meaning: A formal event when business people or politicians meet people from the general public. “Meet and greet” can also be used when people in the same business or with the same interests meet each other and network. OK! Now you can talk about meeting people in different situations and at different levels of formality. How much do you remember, though? Who was the last person you met up with? What did you do? What do you talk about when you meet people for the first time? Have you ever been to a meet and greet? When did you last have to meet in the middle with someone? What was it about? Are you interested when the leader of your country meets with another leader? Why? Why not? Answers in the comments — let’s get the discussion rolling! Did you find this useful? Do you know any people (or owls) that might also benefit from this? Then BE AWESOME AND SHARE! Spread the knowledge! I’ve been following your blog for quite a while and I’m impressed how clear, informative and useful your entries always are. You definitely have a talent for teaching. Thanks for your lessons. P.S. That’s funny how you think of yourself as an advanced English learner and then, all of a sudden, find out that you don’t always use the simple verb ‘meet’ properly! Thanks so much — I really appreciate it and it’s good to hear some people (like you) are benefiting directly from what I write! How about ‘meet my brother at the station – I am very busy and he doesn’t know the city? You might also want to try using “pick up” as well — another common verb for this situation. Hi Gabriel! Let’s try to answer your questions! Who was the last person you met up with? What did you do? I met up with Kailin last weekend to have a pizza and a beer together! What do you talk about when you meet people for the first time? I always try to “break ice” by asking something like How are you? Where are you from?, finding out something in common to talk about. Have you ever been to a meet and greet? I went to postcard lovers’ meet and greet: really interesting, I saw postcards from all over the world! When did you last have to meet in the middle with someone? What was it about? I met in the middle with my boyfriend last night: I wanted to relax at home, he wanted to eat something out, it turned out that we had a pizza at home. Are you interested when the leader of your country meets with another leader? Why? Why not? Basically, I would interested in. However, every time I watch news or something about politics, I always doze off! I’m not really into it! 2. We can “eat out” or “go out to eat something,” but unfortunately “eating something out” sounds a little odd to me. Postcard lovers? At first it didn’t sound interesting — then I thought about it and realised that a postcard collection must be really, really interesting. Were the postcards from all over the world? Can you remember any particularly interesting/weird ones? Thank you so much for your lessons! You have such a good sense of humor! Really like how you explain the tasks – very simple and easy to understand. I’m glad you’ve found them both funny and useful — exactly my intention. Good work for keeping working at your English for so long, too.